Listings of motorcycle riding clubs across the United States. 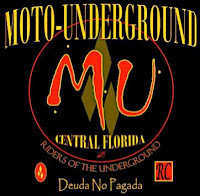 Moto-Underground is a motorcycle Riding Club (RC) focused in the area of Central Florida, (Daytona Beach, Orlando, Kissimmee). The main focus of Moto-Underground is to provide opportunities for motorcyclist in the Daytona, Orlando, and Kissimmee areas to get together, ride, have fun, and improve riding skills in a club sitting. All members of Moto-Underground have equal say in club matters, decision-making, and admittance of new members. Moto-Underground's membership is open to people from all backgrounds and they're no restrictions on make or model of your bike. Just bring your bike, your gear, and be ready to ride. Copyright © 2008-2013, Clear Digital Media, Inc.. All rights reserved.